Salt, flavourings, potato starch, chicken fat (4%), onion, chicken extract (1.8%), garlic, parsnip, maltodextrin, mushroom juice concentrate, onion juice concentrate, sunflower oil, antioxidant (extracts of rosemary). 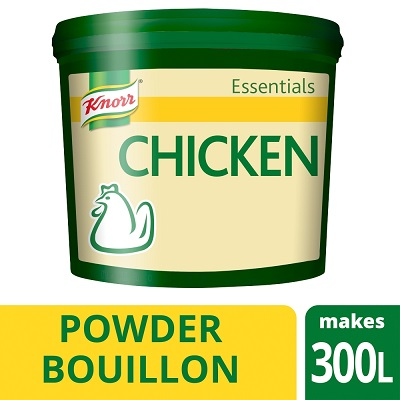 ***Compared to Knorr 123 Bouillon Powder. 1) Dissolve 10g mix into 1 litre of warm water. 2) Bring to boil and simmer for 2 minutes.